Electric egg poachers are counter- or table-top appliances that economically and efficiently poach eggs. 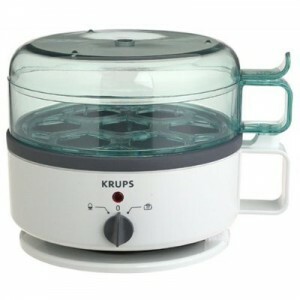 Components include the pan, the tray and poaching cups, a fitted lid, and an electrical cord. These self-contained units usually provide excellent temperature control and cooking time—both crucial to poaching eggs. Because the heating unit is located in the base, electric egg poachers free the stove top, oven, and microwave for other cooking needs and often use less energy than a stove burner. The base holds enough water to sufficiently poach the egg and suspends the poacher cups at the ideal height, taking guesswork out of cooking. The temperature gauge ensures the water is within the ideal temperature range, 160 to 18o degrees Fahrenheit, for egg poaching, avoiding under- or over-cooking the eggs. The cord connects to the base with a single male connection that completely eliminates guesswork and bent or damaged prongs. The cord connects to a wall socket in the standard fashion, facilitating a fast and easy heating process. Just connect the unit’s control plug; connect to the wall, add water, and turn it on. Inventor try’s to impress Judges of Dragons Den to invest into his Electric Egg Cooker. You won’t believe what happens! Most newer electric egg poachers are manufactured with non-stick surfaces, preventing the egg whites from sticking to the surface. If a unit does not provide that non-stick surface, a non-stick spray or a light coat of oil, margarine, or butter easily suffices. So long as the poached egg slides out of the poacher cup, the method used to enable that matters little. Non-stick surfaces in these poachers also allow for easy clean up and avoid risking scratching and nicking the surfaces with a scrub or wool pad to remove cooked food particles. Electric egg poachers can provide a single poacher cup or a dozen in large, deluxe models, or any number in between. Enjoying a quiet meal by oneself or preparing breakfast for a group dynamic, these convenient appliances offer a full array of options. Whether the poacher cups are all solidly incorporated in the poaching tray or are separately placed units, each egg cup holds one egg each, ensuring the delicate egg whites seat and cook separately. How many eggs are poached at the same time is determined, of course, by the number desired and the number of cups available. Consistently poaching eggs isn’t the only use for an electrical egg poacher. The poaching tray can be used as a holding tray for pre-measured ingredients such as salt, sugar, pepper, and other spices and condiments. Sewing or arts and crafts hobby items can be sorted into individual poaching cups; beads, sequins, or buttons, for example, easily fit in poaching cups. Egg poaching cups can also hold paper clips, pins, and thumb tacks, though non-stick surfaces may be damaged by sharp points. Some base units can be used for other cooking needs beyond just poaching eggs, expanding options and enhancing unit versatility. Scrambling eggs, cooking meats, or other functions while keeping the stove top clear can provide a smoother cooking session than having to juggle pots and pans from burner to burner. Electric egg poachers enable greater control over water temperature and cooking time, eliminating the hardest elements of properly poaching eggs. Easy cleaning, reducing stove top clutter and mess, and additional use versatility make these self-contained units a virtual imperative for discriminating chefs of any skill level. This entry was posted on Saturday, November 27th, 2010 at 10:47 am	and is filed under Egg Poacher. You can follow any responses to this entry through the RSS 2.0 feed. You can leave a response, or trackback from your own site.